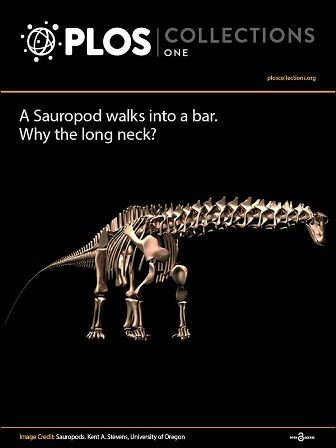 Hey, Sauropod, Why the Long Neck and Tail? With most of their peers, boys and girls who grow up to be paleontologists share an early and intense fascination with dinosaurs. But unlike the rest of us, paleontologists never lose this fixation. The biggest of the big dinos holding them in thrall are the sauropods (think Jurassic Park) -- a clade of lumbering vegetarians that dominated life on earth for 120 million years (give or take) and who still hold the world record as the largest terrestrial vertebrates to ever walk the ground beneath our feet -- and that means you, Colorado, Utah, and Oklahoma, along with many other parts of North and South America. 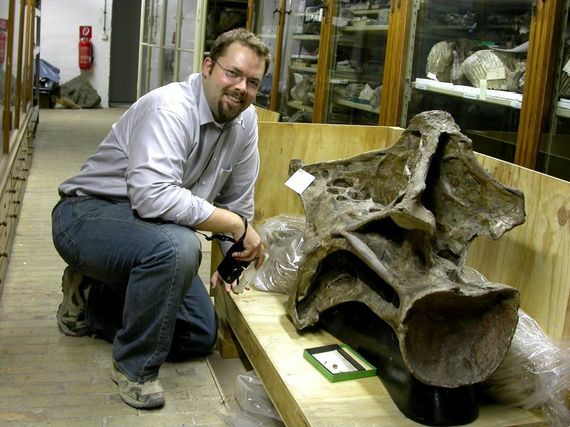 The sauropods' gargantuan size provides the focus of a new research collection (Sauropod Gigantism: A Cross Disciplinary Approach) organized by evolutionary biologist Martin Sander of the University of Bonn and released today by the Open Access science journal PLOS ONE. In it, Sander, with 13 fellow researchers, among them paleontologists, biologists, chemists and ecologists, united to solve a central mystery. As PLOS Blogger Brad Balukjian writes, the main question of this collection can be summed up as: How did these thunder lizards get so freaking big -- and its shuddering corollary, why didn't they get any bigger? Research teams unearthed sauropod remains and reconstructed whole skeletons to amass some tantalizing clues as to what purposes may have been served or ultimately hindered by the extremely long neck and tail, and diminutive head for which sauropods are famous. They studied living animals, from elephants to ostriches, who share some evolutionary similarities and differences with sauropods. Their primary objects of study were fossils, but, as these papers demonstrate, investigators also borrowed newer methods from diverse disciplines, including DNA analysis, 3-D imaging and computer modeling. Still, it's safe to assume that each piece of research in this collection began with a single child's act of wonder about a real life giant, now long gone. Although he was just 3 years old at the time, Matt Wedel has a vivid memory of reading the August 1978 issue of National Geographic magazine. The cover featured dinosaurs and inspired Wedel's lifelong devotion to paleontology. His original copy is long gone -- "I read it until it fell apart" -- so if you have one in your attic, be a pal and send him a replacement. Wedel, a sauropod specialist at Western University of Health Sciences, is a kind of reverse-chiropractor for dinosaurs. While back-crackers twist and turn your spine to release pockets of air in between your vertebrae, Wedel and his colleague Michael Taylor are all about discovering the air spaces inside dinosaur backbones. 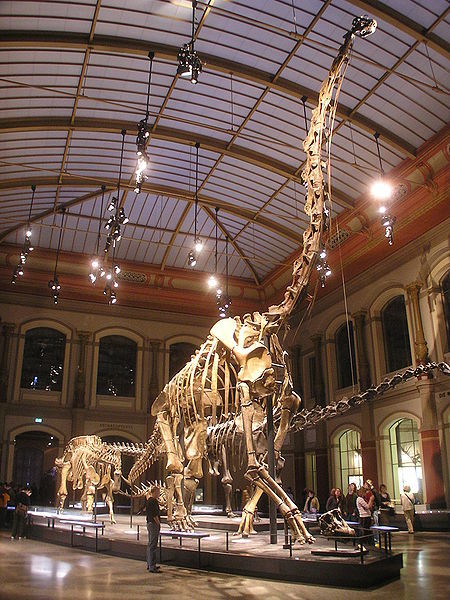 They report finding air-filled bones (more technically "postcranial skeletal pneumaticity") further down the sauropod skeleton than ever before, in PLOS ONE's new Sauropod Gigantism collection. Pneumatic, air-filled bones are well-known from birds, reducing flight load and allowing birds to get airborne. But the holey bones are just one part of an elaborate respiratory system that makes birds much more efficient breathers then us mammals. Unlike our sac-like lungs that hold air and allow for oxygen uptake, birds use tube-like lungs for gas exchange and have separate air sacs for storing fresh air. When we exhale, we don't get any oxygen, while birds can take in oxygen constantly due to their storage capacity. "Birds can extract a lot more oxygen from the air than we can," Wedel says. "That's why birds can take off and fly up to 30,000 feet and be just fine while human climbers over 24,000 feet are passing out and seeing yeti." Evidence continues to pile up that non-avian dinosaurs had a respiratory system closer to modern birds than mammals, which should perhaps not be too surprising given that they're all part of the same clade. 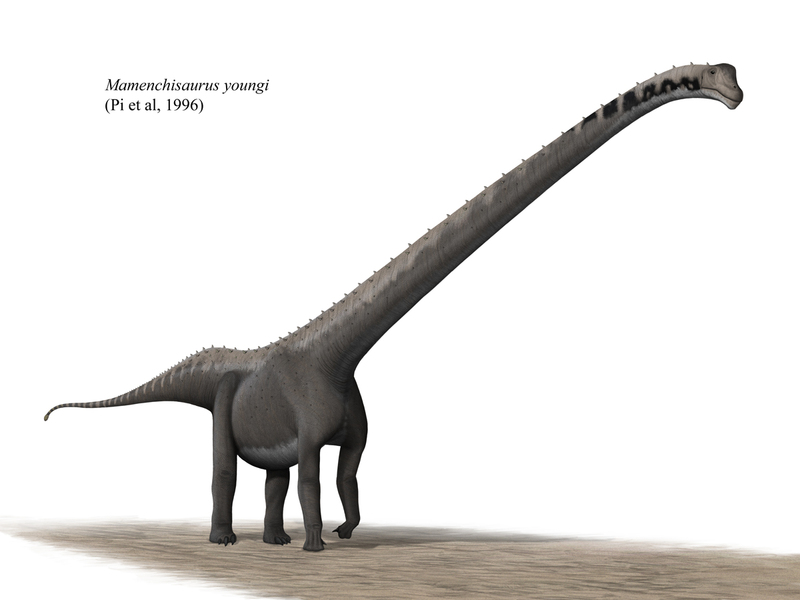 The avian-style lung is one of the key innovations proposed by collection editor Martin Sander to explain the eventual gigantism of sauropods. According to Sander, the lung and its accompanying system of air sacs and diverticula (the pockets of air-filled tissue that hollowed out bones) lightened the neck (allowing it to get bigger) and created a highly energy-efficient respiratory system. Wedel has been hot on the tail for some time now, finding new evidence of sauropod pneumaticity in unexpected places. While mostly-hollow bones are well-known further up the spine, Wedel and Taylor noticed holes in the tail vertebrae of sauropods like Apatosaurus (the erstwhile Brontosaurus), beasts that were supposed to have nothing but solid bone. Intrigued, they started doing some paleontology on paleontology, combing yellowed literature for earlier discoveries of holey sauropod bones. "It turns out people have been describing these air spaces in Apatosaurus for 100, 110 years," says Wedel. "It's just that somehow nobody really paid attention to them." Excavating the bowels of Berlin's Museum für Naturkunde, they examined the tail vertebrae of 12 specimens of the sauropod Giraffatitan along with the tail of the mounted Apatosaurus in the Yale Peabody Museum. Armed with little more than step ladders, tape measures, digital cameras, and good balance, they found lots of holes scattered throughout the tail bones as far down as vertebra 24, almost halfway down the tail. But there was little rhyme or reason to the location of the holes. The holes' function, especially in the tail, remains a mystery. It's clear that they have some kind of connection to the air sacs and lungs and are therefore part of the respiratory system -- one particularly gory experiment bears this out, Wedel explains. In 1758, the English anatomist John Hunter chopped off part of a bird's wing, tied a string around its neck to strangle it, and then showed that the bird could still breathe through the hole in its humerus. The paper, in case you're interested, was published in 1774 ("I get a kick out of being able to cite a paper that's older than our country," Wedel says). Beyond that, pneumaticity's function is likely to lighten the skeleton, allowing for traits such as long necks and flight. But its function may not have started out that way, Wedel cautions. Although just an untested hypothesis at this point, Wedel thinks that the purpose of the sauropods' pneumatic tail bones may have been nothing at all; that is, they evolved randomly, much like humans' sinuses, our own version of pneumaticity whose function remains unknown. The haphazard location of holes along the tail furthers the notion they may have been selectively neutral. At some point, enough variation in tail pneumaticity likely existed for selection to pick up on the advantage of a lighter tail, just as it would favor a lighter (and thus longer) neck. While much of the research in this collection focuses on the sauropod neck, "we forget that they have these kind of miraculous gigantic organs sticking out the other ends of their bodies, too," Wedel says. Big tails can be useful for kicking tail. "Iguanas that are six feet long can hit people hard enough to split a leather jacket," he says. "I shudder to think what a 60-foot apatosaur could do with its tail." Brad Balukjian blogs for the PLOS BLOGS Network. Visit to read more about the new PLOS ONE sauropod research collection.